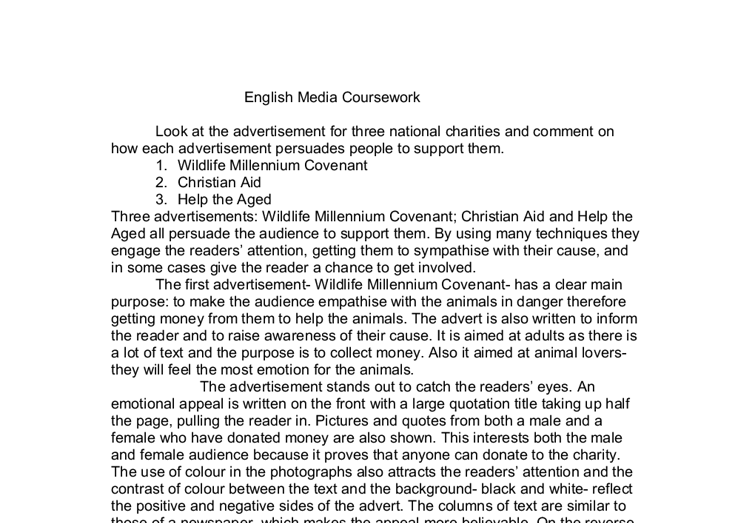 English Media Coursework Look at the advertisement for three national charities and comment on how each advertisement persuades people to support them. 1. Wildlife Millennium Covenant 2. Christian Aid 3. 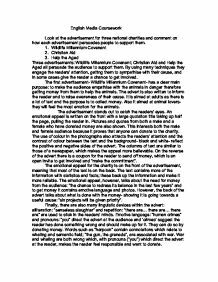 Help the Aged Three advertisements: Wildlife Millennium Covenant; Christian Aid and Help the Aged all persuade the audience to support them. By using many techniques they engage the readers' attention, getting them to sympathise with their cause, and in some cases give the reader a chance to get involved. The first advertisement- Wildlife Millennium Covenant- has a clear main purpose: to make the audience empathise with the animals in danger therefore getting money from them to help the animals. The advert is also written to inform the reader and to raise awareness of their cause. It is aimed at adults as there is a lot of text and the purpose is to collect money. Also it aimed at animal lovers- they will feel the most emotion for the animals. The advertisement stands out to catch the readers' eyes. An emotional appeal is written on the front with a large quotation title taking up half the page, pulling the reader in. Pictures and quotes from both a male and a female who have donated money are also shown. This interests both the male and female audience because it proves that anyone can donate to the charity. The use of colour in the photographs also attracts the readers' attention and the contrast of colour between the text and the background- black and white- reflect the positive and negative sides of the advert. ...read more. reflects the story in the text. The long quote underneath the picture emotionally involves the reader and interests them in the cause. The first section of the text is mainly about the conditions the people in the third world work in and the remainder of the text is about how the problem can be solved. This positive and negative contrast is reflected in the black and white colour of the picture. A quote towards the end of the text contains a fact, which backs up the claims made in the advert. Finally, many linguistic devices are used; sometimes to trigger certain emotions or to make sure the reader remembers the cause. The reader is made to remember the advert with the use alliteration: "entire economies" and repetition: "listen to...listen to". 'Entire' suggests the problem is on a massive scale. The advertisement connects with the audience by using emotive language: "heart-rending stories of exploitation" which will encourage the reader to sympathise with the workers and find out more. The use of questions and pronouns: "Are you sure the fruit you buy is full of goodness?" aims the cause at the readers, in effect they feel responsible and want to do something about the problem. The advertisement is successful in persuading the audience to find out more information and help their cause. This is done with the use of many devices and a clever structure which attracts the readers' attention, gets them involved and wanting to help- resulting in the advert reaching its aim. ...read more. The Help the Aged advert also differs in the way that it is written in the form of a letter, rather than a newspaper like the other two adverts. Many of the linguistic devices are similar in all three adverts but the advert containing the most devices is the Wildlife Millennium Covenant. The Christian Aid advert is much briefer than the other two advertisements as it is much shorter and gets to the point a lot quicker. In some ways this can benefit the charity (the reader doesn't have to spend a lot of time reading it and if they would like more information they will send off the coupon) but in others it cannot, as the reader may want easier access to more information. After many comparisons, I think that the Wildlife Millennium Covenant advertisement is the most successful in interesting the audience, involving them in the charity and resultantly persuading them to donate money to their charity. I think it is superlative because of: the use of quotes from both a male and female- attracting a wider audience; the use of connotations and semantic field which are rarely found in the other two adverts and add to a dramatic effect; the directness to the reader- pronouns, rhetorical questions and a donation coupon and finally because of the clever layout- the large picture and emotional appeal on the front to pull in the reader, then more information on the reverse. All these factors, I believe, make the Wildlife Millennium Covenant advertisement the most persuasive advert. ...read more. To men she would be an object of desire, someone to demonstrate their superiority, power and dominance over by taking away important female values, destroying their confidence. Her mouth could represent her being silenced by men, that she should not tell anyone about what has happened to her. The writer of Text A use very persuasive language. Also more was written in text A than in text B. Furthermore the price for text A was much cheaper than the computer in text B. But the price for text was indecisive, and could change according to the store it was sold in. There is also text around the edge of the page, which makes the reader pay close attention to the advertisement. This could also be interpreted as the way in which people become trapped by poverty, as the text 'traps' the appeal. of the reader; the way the information is presented makes compelling reading appealing to readers with a social conscience. The layout and organisation of the one page advertisement is visually complex, and deliberately so, because the intention of the presentation technique is attention grabbing. and a boy for the kitchen there maybe some outrage or sense of strangeness as in most advertisements there are certain 'girls things' which are only advertised for girls and certain 'boys things'. For example when action heroes such as Spider man, Action man or Super man are advertised there are never any girls on the page. Charities advertise to raise money for the needy. They make people aware of the issues that are ignored by most and send out messages that some people need help. Nearly half the advertisements we see on television or hear on the radio are from charitable organisations. This in turn, derives a further lexical formulation with enhanced semantic loading which, in addition, elevates the status of the product. ?TSB? and ?A&L? also use monomorphemic lexis, which are not divisible into smaller parts and are therefore uncomplicated in comprehension.